Some of us love old school stuff, not wanting to move on with the times simply because of the hold of nostalgia over us. As for others, we would prefer to always stay on the cutting edge of technology. 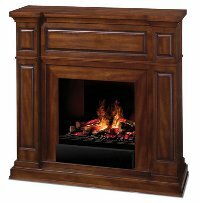 Those who fall under the latter category, the $2,000 Most Realistic Electric Fireplace is something that you might want to explore that will keep both sets of “fans” happy – it sports an old school design that will not look out of place no matter how modern your home is, while ensuring it is up to date with the latest technology to keep you and your family warm and toasty during the cold winter season. This electric fireplace creates dancing flames and smoke which are pretty difficult to tell from the real deal, where a fine evaporative mist rises up through glowing, half-burnt logs and embers, and in order to recreate a heart-warming fire, an integrated LED light will reflect and refract within the water molecules, so that it creates an enchanting, three-dimensional fire. You will be able to adjust the visual intensity of the flames and smoke using the included remote control, while the integrated 1,440-watt fan-forced heater produces 4,915 BTUs of heat that ought to be good enough to warm everyone within the vicinity up.